This February, York Designer Outlet welcomed a class of Year 4 pupils from Haxby Road Primary Academy to take over the outlet for a day, where they became sales assistants, visual merchandisers, shop designers and much more! This project is one of our ever-popular Inspiring Minds modules (formerly known as York Children’s University), that aim to inspire children aged 7 to 11 to aim higher and work harder by bringing the world of work to life. 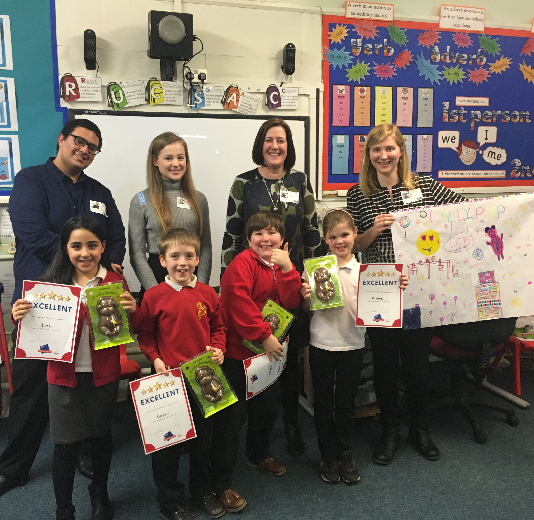 Here, the children were tasked with designing and pitching their own shop to a team of managers at the Designer Outlet, gathering ideas by going behind-the-scenes at the stores. However, none of this would be possible without the work of a brilliant student volunteering team from the University of York, who have recently been nominated for a Volunteering Award for their fantastic work. Jermaine, Mariam and Laura designed and delivered two wrap-around sessions to introduce the pupils to world of retail, and acted as wonderful role models to the pupils throughout, giving them an insight into university life. The project has proved to be a great example of bringing together employee and student volunteers, and the wonderful results this partnership can have. Jo Clarke, Retail Manager, said: ‘York Designer Outlet feels it is important to support York Cares as we enjoy giving back to the community and getting the younger generation excited about retail’. We are excited to work with Jo and her team again next year to deliver even more activities in our local primary schools. Thank you to everyone who took part!